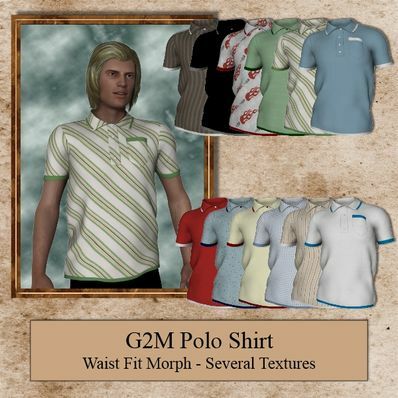 Polo Shirt for Genesis 2 Male for use in Daz Studio 4.6. Morphs for fitting outside pants included. I have also included several Textures. Unzip and copy the files to your "DAZ 3D/My Library"
Thank you very much, I really needed this! I took the steps of unzipping the file to "My Library". But when I opened the game, I couldn't find any of your clothes I installed. Thnx! G2M can use this for sure. Thank You, looks really good. Thanks for all you do. There's not enough men's clothing. This will be really useful. I love your work very much. Thanks for this and all your other creations! A very useful and nice shirt. Thank you! Very preppy and fashionable! :) Thanks for making this shirt! Male clothing is always most welcome. There really isn't that much of it. Thanks, Wendy. Love the Polo Shirt. Can't wait to see all the various textures. LOve that you sectioned off the little cuffs on the pocket top, arms and bottom of the shirt, so we can mix and match up different materials. You always are so delightfully detail-minded. Thanks soooo much!!! Nice one! Fills a niche that I have wanted to fill for a long time. Thank you so much! Looks very well! Thanks muchly. This is a very lovely shirt & textures. Thanks for sharing.